Kenneth L. Butters | Attorneys | Brick Gentry, P.C. Ken Butters brings a great deal of experience to the Brick Gentry team. Ken practices primarily in the areas of business/corporate law and commercial/business litgation. He is counsel for a number of Iowa businesses and is extremely well-versed in areas relating to contract law and business litigation, including class actions and other complex litigation. 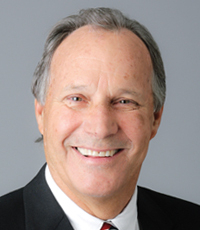 Ken received his law degree with distinction from the University of Iowa College of Law and has been practicing law in the state for more than 40 years. Ken is incredibly active within the community having received the Governor’s Public Service award and currently serving on the Board of Directors for the Free Clinics of Iowa. Brick Gentry's United Way "Protein Picnic for Kids"